I remember the first time I made a traybake. It was after watching a Jamie Oliver programme quite a few years ago before I started blogging or even cooking properly. It was such an easy, throw it all together idea and I’ve probably made something similar once every month or two since then. It’s normally a use up all my odds and ends recipe but this time I had just done my shopping and fancied a lazy meal with minimal cleaning up afterwards so it was more of a planned meal than usual. It turned out so well that I decided to blog the recipe but bear in mind this is really easy to adapt and use up anything you have in the fridge or veg basket so don’t worry about following too closely. 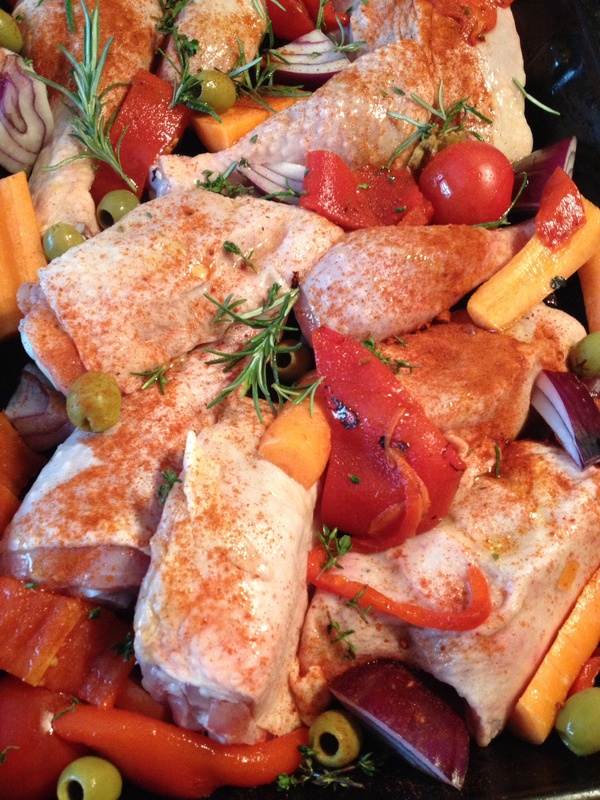 Place all your ingredients into a roasting tray, trying to evenly distribute the meat amongst your other ingredients. Sprinkle over your herbs and pour over olive oil. Sprinkle over your paprika, salt and pepper and bake for about an hour. Check every 15 minutes or so and give it a shake/baste if required. Remove from oven and allow to stand for 5 minutes before serving with a large green salad. Enjoy. Fancy a citrus twist then try this Orange & Lemon Chicken from Foodie Quine or perhaps this Lemon Sole Traybake from Family Friends Food. Thanks for mentioning my Orange & Lemon Chicken. Your dish sound fab. Love the inclusion of olives. Can’t beat a bung it all in one dish recipe. I throw olives into loads of dishes. Yes one dish cooking is the way forward I think.. For lazy cleaners like me. This is one of my favourite ways to cook, particularly in the spring and summer, so easy and not too much washing up! Oh yum. I love crispy potatoes. 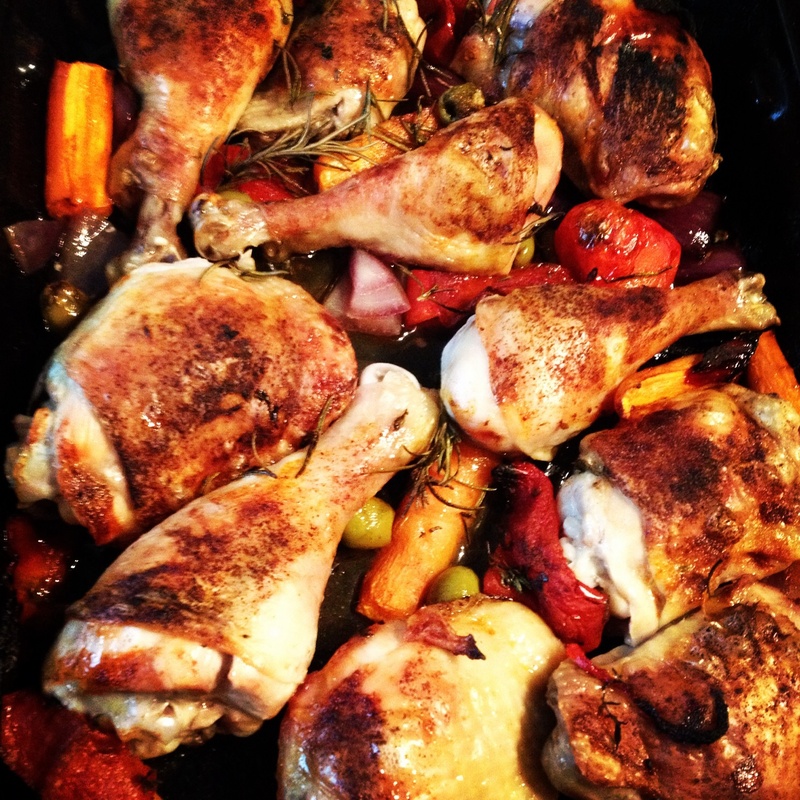 A great midweek meal idea! Love the flavours in this dish!